Today we had our first on-campus visitors from the states. 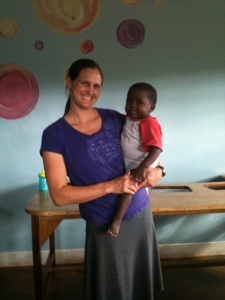 My parents' church has several people who are involved with short-term missions in Uganda. Earlier in the month we got to briefly visit with Bob Hayes, a pastor from Panama City, FL, who comes to Uganda at least a handful of times each year. He was in Jinja for the day and made time to see our family. It was great to see him, and he brought some gifts and Honey Nut Cheerios from my parents. We were all very excited! But the Cheerios were gone in a matter of days. Today another group came from Panama City. We now have been resupplied with Honey Nut Cheerios along with a few other items. It was so much fun to take our visitors around campus and tell them all about the ministry at Good Shepherd's Fold. I think one of the highlights might be going to the Babies' house. I love holding those babies! My children really enjoy going there too. 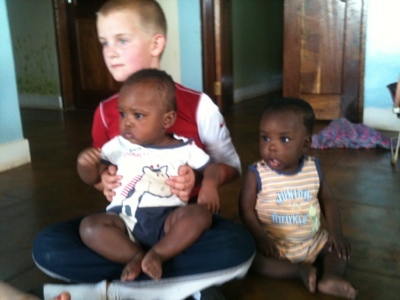 I did not take any photos during our visit today, but below is Elijah at the babies' house on a previous day. All my kids really enjoy going to visit with the babies. Zeke goes back and forth between wanting to take their toys and wanting to pick the babies up and hold them. Obviously I have to keep a close eye on him. Here I am holding a boy named Moses. He is such a sweet boy! I don't know his whole story, but I do know that he is about 4 years old but not yet walking. Many of these babies arrive in pretty bad condition, and it is beautiful to see them recover and grow.